Steve LeFever, our Founder and Chairman, travelled over 200,000 air miles this year, sharing the Profit Mastery tools and processes with clients around the world. Recent trips include San Diego, California (The UPS Store, Right at Home), Las Vegas, Nevada (Rainmaker, Jimmy John’s), Saipan in the Northern Mariana Islands (SBDC/Chamber of Commerce), Australia (Subway/IPCA, MFAA, and the Franchise Relationship Institute), New Orleans, Louisiana (IFA), Hawaii (La Quinta), San Antonio, Texas (Pearle Vision), Tampa, Florida (FL SBDC), Orlando, Florida (ServiceMaster), Huntington Beach, California (Team Logic IT), Anaheim, California (Papa Murphy’s), Grapevine, Texas (ASBDC Annual Conference), and Guam (PI SBDC). Profit Mastery is the cornerstone of the financial education portion of the International Franchise Association’s Certified Franchise Executive (CFE) program. 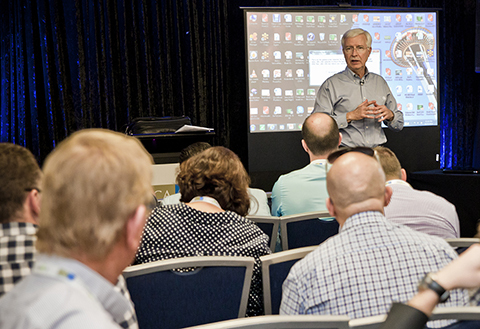 This year, for the very first time in Australia, Rod Bristol presented the one day financial Boot Camp program as part of the Franchise Council of Australia’s Annual Conference in Sydney in October. Over 20 Australian franchise executives attended the program and gave it rave reviews. Rod will be back in Australia for the first week in February presenting the complete two-day Profit Mastery program to two Australian clients. 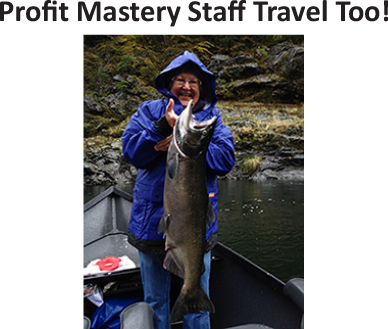 Here's our wonderful Profit Mastery University registrar Vicki LeFever fishing on the Rogue River in Oregon. Vicki says, "Besides this beauty, we caught lots of Steelhead (a feisty fish!). Nothing like having freshly-caught Steelhead barbecued on the beach every day by our river guides!" Next time, we'll have photos from our General Manager's trip to a bonobo sanctuary in the Democratic Republic of the Congo! By setting a schedule in place to finalize your statements for the year, you can get a head start on tax planning. Take pro-active steps now and avoid the tax season rush. Click here for our End of Year checklist. to anywhere in the continental USA! "The Profit Mastery tools are unbelievably insightful and effective!" We have been hearing this for years from Profit Mastery alumni. We have been asked many times -- is there a way to receive the data in the format learned in class, without having to enter the data manually or perform time-consuming calculations? Now we can say absolutely YES! Profit Gap is here and ready for any QuickBooks user. Profit Gap automatically illuminates significant profit and cash flow opportunities with a click of a mouse. Profit Gap puts the full Profit Mastery financial management process into immediate action. BRS Chairman Steve LeFever on Profit Gap: "We believe Profit Gap is the biggest step forward in financial analysis in years!" Special offer: one free Profit Gap report. No strings attached! Select the Platinum plan you would like to order (either monthly or yearly). This offer is valid for the Platinum plan only. Enter the discount code 50percentoffpg2015 in the shopping cart to receive 50% off your plan. Once your card is approved, you will be automatically be re-directed to the login page for Profit Gap. You will then be logged into Profit Gap where you can start your free trial. About one month later, you will receive an email letting you know that your free trial is nearing an end, and you may cancel. If you do nothing, your card will be charged 50% off the retail price and you will be able to continue to run Profit Gap reports for as long as you would like. This monthly online service allows you to immediately take corrective action in vital areas affecting cash flow and profitability. Click here to view a sample Profit Gap report in a .pdf format. Profit Mastery is on Facebook and we'd love it if you'd join us there! Simply "Like" and make a comment on our Facebook page and you will be entered to win one year of online access to Profit Mastery University -- that's a $695 value! Profit Mastery University is a user-friendly and funny seminar that teaches how to manage a company from its financial reports -- delivering powerful, effective and sophisticated financial performance tools in a plain English, laugh-out-loud streaming video format right to your computer. follow us on Twitter to receive updates and financial tips!